Writing Starter Second Edition 은 총3권으로 구성되어있고 초등 중급~중등 중급 수준의 학습자들을 위해서 고안된 교재이다. 많은 교사와 학생들이 라이팅은 가르치고 배우기 어려운 스킬이라고 한다. Writing Starter 은 이처럼 막연한 두려움을 가지고 있는 학습자들이 라이팅에 보다 친숙함을 느끼게 하고자 고안된 과정 중심의(Process-Oriented)쓰기 교재이다. 무엇보다도 구판(2007년)의 단점을 최대한 보완함과 동시에 현재의 라이팅 트렌드에 맞는 새로운 액티비티를 추가하여 구판을 전반적으로 업그레이드한 개정판이다. 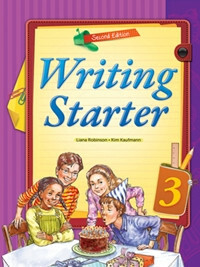 Writing Starter 2nd Edition is a three-level children’s course in written English. The series progresses from writing sentences within a paragraph to writing independent paragraphs. The books are intended to be used in succession but can be used individually. Though the primary focus of the series is on writing, it will enhance student’s command of English as a whole. The Writing Starter series systematically aids students in their ability to present information about themselves?their opinions, feelings, experiences, and ideas?clearly and confidently. The books present language in a receptive mode first through model paragraphs. The activities in the books progressively move students away from models while still giving guidance for students to express their thoughts. Each unit combines exposure to language, students’ development, and practice. The goal of the Writing Starter series is to give students the tools they need for confident and clear writing in English. · Writing Starter 1 emphasizes sentences with the context of a paragraph. While the book is geared towards the production of sentences. · Writing Starter 2 teaches basic paragraphs. It is a continuation from the first book, where students learned to construct sentences. · Writing Starter 3 teaches advanced paragraphs. Students learn to compose different types of paragraphs and to use different writing styles.